Kona’s Source for Bouncers & more! Price: $300.00 for the first 3 hours, $75.00 per additional hour. 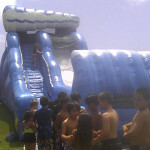 The Volcano Water Slide is a 20 ft high, single lane slide with attached pool landing. This one has a weight limit of 200 lbs. and is 30 ft in length. Perfect for those backyards with limited space and fun for adults and children alike. Price: 375.00 for 3 hour rental includes attendant. Extra hours available. This slide’s shark fin stands 16 ft high with a slide height of 12 ft and is perfect for young riders with a weight limit of 120 lbs. Price: $300.00 for a 3 hour rental, not eligible for drop off special. 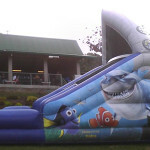 This 24 ft high slide will keep them coming back for more. Weight limit is 200 lbs with one rider at a time. Price: $375.00 for a 3 hour rental, not eligible for drop off special. 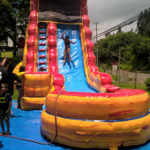 30 ft long double lane wet slide is the perfect play off off the old school slip n slide except on this one you are off the ground and land in a pool of water. Weight limit is 200 lbs per person with a 2 person maximum at a time. Price: $325.00 for a 3 hour rental with attendant. Drop off special pricing is $275.00 for a 4 hour rental without attendant. 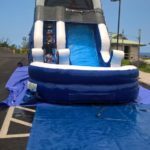 This 20 ft high single lane water slide is great for kids up to 150 lbs. Price: $350.00 for a 3 hour rental, includes set up/down and attendant. This item not available for drop off. 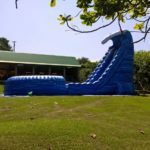 This is a 28 ft high double lane water slide with attached slip ‘n slide and pool. Weight limit is 225 lbs. Price: $550.00 for a 3 hour rental which includes set up/down and attendant. This item not available for drop off. 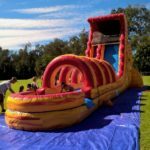 This 20ft single lane water slide with attached slip n slide is perfect for children and adults. The extended ride and splash pool will provide you with hours of fun. Weight limit is 200lbs. 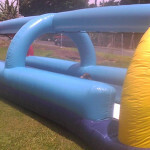 Price: $425.00 for a 3 hour rental, includes set up/down and attendant. Extra hours are available, just ask about pricing at time of booking. Not available for drop off. 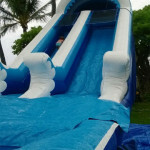 This 30 ft high double lane water slide with rip curl attachment and pool will be sure to have you coming back for more. Two riders can ride at one time and the weight limit of 225 lbs. Makes it great for adults and children alike. This slide is also good for back yards and areas where space is limited. We need only 60ft to get this giant up and running for you. Price: $600.00 for a 3 hour rental, includes set up/down and attendant. Extra hours are available, just ask about pricing at time of booking.